The feasts of St. Blaise and St. Ansgar, which are ordinarily celebrated today, are superseded by the Sunday liturgy. The first reading is taken from the book of Jeremiah (Jer 1:4-5, 17-19). Jeremiah is the second of the four great prophets of Israel; a contemporary of Zephaniah, Nahum, and Habakkuk. He was born in the last part of the reign of Manasseh, about 645 years before the birth of Jesus and almost a century after Isaiah. Today's reading comes from the prologue which gives an account of Jeremiah's calling. It is a dialog between Yahweh and Jeremiah. The second reading, taken from the first letter of Paul to the Corinthians (1 Cor 12:31-13:13), continues last week's comparison of the Church to the human body. Each part of the body is no greater than any other part; rather, all work together to serve the common good. The second reading also discusses the gifts of the Holy Spirit. The Gospel reading is taken from St. Luke (Lk 4:21-30). This rejection of Jesus by his own townfolk must have sincerely grieved him. But it was only the beginning of similar rejections. Their attempt to murder him was an indication of what was yet to come. "To his own he came but his own did not accept him" as St. John says (1:11). The reason was that the Messiah they were looking for was a political leader who would make Israel a political power not only among the nations but over the other nations. Nearly all the messianic prophecies had references to the universality of the messianic kingdom–this universality they interpreted in a political, worldly sense. Their interest in things spiritual was then at a very low ebb and therefore the message of Christ had little interest for them. They did not want a spiritual kingdom. For seventeen centuries they had been God's Chosen People, and they were proud of their superiority over the sinful Gentiles who did not know the true God. That very pride of theirs was their undoing. The Gentiles were God's children too, and they also were to share in the new kingdom which the Messiah would establish, but the very thought of this was abhorrent to the vast majority of the Jews. 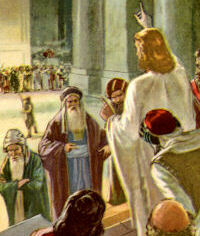 In spite of all their opposition, however, Jesus spent his public life amongst them. He gave them the first offer of entering the new kingdom. They could still continue to be God's Chosen People together with, and alongside, the other nations of the earth. They refused. And their refusal went so far as to call in the aid of the hated Gentiles to crucify the One—their own fellow Jew—who had come to bring them the message of the true kingdom and the offer of being its first citizens. There were exceptions, of course, and honorable exceptions at that. Christ founded his Church, the new kingdom of God on the Apostles, who were Jews, and through their noble sacrifices and efforts, the kingdom spread to all the Gentile nations of the earth. Because of their sacrifices, we are Christians, members of Christ's kingdom on earth and heirs to his eternal kingdom in heaven. Through our Christian teaching we have learned that our life on this earth is but a period of preparation, a period during which we can earn the true life as citizens of his eternal kingdom. How often do we, like the Jews of Christ's day, forget this and bend all our efforts to building for ourselves a kingdom of power or wealth in this world, a kingdom which we will have to leave so soon? We would not, of course, openly deny Christ, much less try, like his neighbors in Nazareth, to throw him to his death over a cliff: but how often in our private actions, and in our dealings with our neighbors, do we push him and his doctrine quietly aside and act as if we knew him not. In this we are no better than Christ's neighbors of Nazareth and we grieve his loving heart as much as they did on that sad day. Am I one of those (each one of us can ask himself)? Do I really love Christ or, to put it in a more personal way, do I really love myself ? If I do, I will not risk losing my place in the eternal kingdom for the sake of some paltry pleasure or gain in this present life which will end for me so very soon. "'Why are you fearful, O you of little faith?' Then He arose and rebuked the wind and the sea, and there came a great calm" (Gospel). This is a picture of both the human and the Divine in Jesus and in His Church (symbolized by the dome of St. Peter's at the right). Jesus, a tired Man, fell off to sleep during "a great storm." Jesus, the tireless, wide-awake God, "arose," as it were from the tomb of a dead sleep, to restore "a great calm." Enemies of the Church are ever ready to gloat over our human "weakness" (Prayer, Secret), tossed about by the "waves" of human passion, by the "winds" of inhuman evil spirits. The Divine Presence is within our baptized, absolved souls. Let us rise up "from the facination of earthly things" (Postcommunion).